By the time of his death from AIDS at the age of 31, Keith Haring (1958-1990) was already a wildly successful and popular artist. Haring's original and instantly recognizable style, full of thick black lines, bold colors, and graffiti-inspired cartoon-like figures, won him the appreciation of both the art world and the general public; his work appeared simultaneously on T-shirts, gallery walls, and public murals. 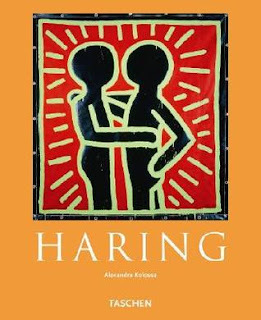 In 1986, Haring founded Pop Shop, a boutique in New York's SoHo selling Haring-designed memorabilia, to benefit charities and help bring his work closer to the public and especially street kids, with whom he never lost contact. This is a lovely book and a wonderful introduction to the work of Keith Haring. If you read John Gruen’s biography of the artist and found it lacking in artistic analysis, this book is the perfect companion. Reading both books will provide a full picture of the artist and the man. I would like to time travel to 1982 to see the Keith Haring exhibition at the Tony Shafrazi Gallery in New York, which was given a two-page spread on pages 25 and 26. At that time, I was not yet familiar with the artist’s work. It wasn’t until the late 80’s when I got to know his powerful AIDS-themed works. I love Haring’s versatility. Starting out with chalk drawings in subway he moved on to a wide variety of surfaces, creating complex designs that were bold, colorful and energetic. Keith Haring was an artist for the people. Though public recognition was important to him, acceptance by museums was a lot slower in coming. It wasn’t until after his death that his work was shown in major exhibitions. The illustrations are well organized and the text is easy on the eyes. This is a worthy addition to any art library.